Today, at the Global Wind Summit in Hamburg, the Nordex Group received the official statement of compliance for design according to IEC and type test certificates according to DIBt for the N149/4.0-4.5 from TÜV SÜD. As part of type certification according to international IEC standards TÜV SÜD tested and evaluated the overall concept as well as all the principal components of the N149/4.0-4.5. In issuing the "Statement of Compliance for the Design Evaluation“ according to IEC 61400-1 the independent certifying agency has confirmed the quality of the standard-compliant design of the N149/4.0-4.5. The turbine can be operated both with standard rotor blades and with anti-icing rotor blades for cold regions. Dr. Anke Zölder, Project Manager for Certification at the Nordex Group: "We are now pleased to have obtained the certification for the N149 on time, especially as this is the first time TÜV SÜD has conducted complete turbine certification of a Nordex platform. The IEC 61400-1 statement of compliance is of particular importance for international marketing of the N149. Investors, project planners and wind farm operators expect their wind turbine generators to be certified in accordance with international standards. In this context, as a rule IEC certification is considered a prerequisite for tenders for international wind power projects. This is a recognised procedure and frequently the first step in the project certification process." In addition to IEC type certification, the German market also requires separate certification according to the German DIBt 2012 Standard – the so-called DIBt type test. Parallel to this, TÜV SÜD has now also issued DIBt type test certificates for the N149/4.0-4.5 for hub heights of 105, 125 and 164 metres. These options can also be fitted with standard rotor blades or anti-icing rotor blades. 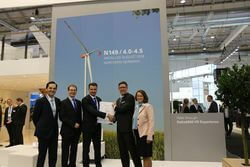 Dr. Martin Webhofer, Head of the Certification Office for wind turbine generators at TÜV SÜD: "Collaboration with Nordex showed very rapidly that it was possible to meet the ambitious time-to-market requirements thanks to professional project management and a high level of technical expertise." The N149/4.0-4.5 wind turbine generator has a nominal capacity of 4.38 megawatts (MW) with a rotor diameter of 149 metres and can also be operated in alternative modes with 4.0 MW and 4.5 MW, depending on the specific site requirements. At an international level the N149/4.0-4.5 is installed with hub heights of between 105 and 164 metres and is also suitable for cold climate sites.